Welcome back! Last time we wrote, we talked about how soda might be working to compromise your oral health. However, soda actually isn’t the worst thing you could be doing for your oral health. That privilege is reserved for smoking. Not only can smoking result in bad breath and severe tooth discoloration, but it can promote the growth of more serious conditions such as tooth decay, gum disease, and oral cancer. Smoking also slows the rate at which your body heals, which, if you are trying to restore missing teeth, can make it harder for treatments like dental implants to succeed. Today, oral and maxillofacial surgeon Dr. Ahmad Chaudhry is blogging from his Bethlehem, PA office to talk about smoking and how it can affect the dental implant process. During the dental implant process, an implant fixture is placed along your jawbone, which will then enter you into a three to six-month long healing period. As your implant fixture heals, a process called osseointegration works to fuse your fixture to your jawbone, turning it into a permanent feature of your oral anatomy. However, for some patients, this integration can be interrupted by an inflammation of the tissues directly around the fixture. This is called peri-implantitis and, while it can occur in any patient, tends to be far more frequent in patients who smoke. 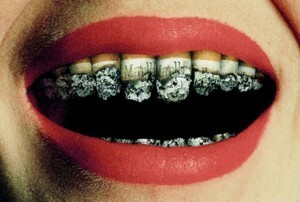 Smoking can have many other effects on your oral health other than just causing the failure of your dental implant. For instance, smoking lowers the circulation of blood in your body, which makes it much more difficult for your body to heal itself. The nicotine in tobacco can also damage the tissues that make up your jaw, teeth, gums, and facial muscles. 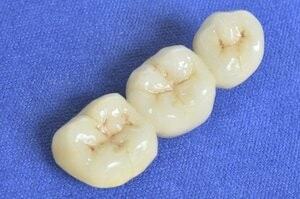 Enough of this damage can result in even more missing teeth, further exacerbating your problem. And, because smoking can prevent dental implants from succeeding, you won’t even be able to replace the additional teeth you lose to the habit. One further effect that smoking can have on your oral health is the fact that the habit can increase the rate at which your jawbone deteriorates. Jawbone deterioration occurs when a missing tooth causes the section of the jawbone that tooth was connected with to no longer get the exercise it needs to maintain itself. Without this exercise, the jawbone deteriorates, which is accelerated by smoking. Jawbone loss can lead to facial deformation, resulting in the patient developing a sunken appearance as their cheeks will look hollow. It is also true that the skin directly around your lips may begin to prematurely wrinkle. If you smoke and conditions like jawbone deterioration and gum recession are keeping you from pursuing treatment with dental implants, chances are high that smoking is the cause. For this reason, it is important that you consider giving up the habit before beginning treatment for your missing teeth using implants. If you would like to learn more, please contact our office and schedule a no-obligation consultation with Dr. Ahmad Chaudhry today.